After spending $1.1 billion on share buybacks over the past 14 months, the burrito chain isn’t letting up. Chipotle Mexican Grill (NYSE:CMG) is not letting the foodborne-illness outbreaks from last year and the year before go to waste. In the course of pre-releasing its fourth-quarter earnings, the burrito chain announced that its board of directors has added another $100 million to the company's share repurchase authorization. The move comes on the heels of Chipotle's especially aggressive buyback campaign over the past year. 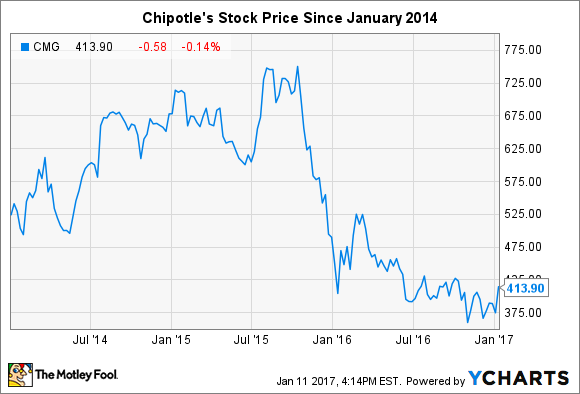 In the 12 months before the chain's stock was pummeled -- which began in the wake of an e. coli outbreak in November 2015 -- Chipotle bought back an average of $16 million worth of stock each month, largely to offset dilution from the issuance of shares to executives. After Chipotle's stock fell, however, it began gobbling up its own shares. It bought back $100 million worth of stock in November 2015, $211 million worth the following month, and $238 million worth in January of last year. Chipotle carried on in this vein through March 2016, after which it slowed the pace of its repurchases, as the cash on its balance sheet began to erode. All told, the company has bought back more than $1 billion worth of stock since its foodborne-illness saga first struck. That equates to a 7.5% decline in its outstanding share count. Analyst: What level of share repurchase is accounted for in fiscal 2017 earnings guidance? Moran: We'll want to keep a strong balance sheet, somewhere in the $0.5 billion or a little higher on the balance sheet. And then we'll take excess cash flow and use that. So if in your model, if you take excess cash flow to assume that we kind of keep what's on the balance sheet or about what's on the balance sheet today and use any excess to buy back stock, I think you'll be in the ballpark of what we'll actually do now. We'll be opportunistic and we'll be more aggressive if the stock drops and less aggressive when the stock increases, but generally that's the approach we'll take. It's easy to look at this as an irresponsible thing to do. Isn't spending cash in the midst of struggles the worst time to do so? Although this is how it seems, the reality is the opposite. Assuming that Chipotle goes on to bigger and better things, which it will, as countless other restaurant chains have after experiencing similar setbacks, then buying back stock when it's cheap is exactly the right thing to do. As William Thorndike points out in The Outsiders, an excellent book on capital allocation, using buybacks in this way propelled the extraordinary shareholder returns associated with many of the best CEOs since World War II. Whether Chipotle will ultimately be applauded for doing the same remains to be seen. But either way, it certainly seems to me that executives at the burrito chain understand and appreciate the value that buybacks at today's prices offer to its shareholders.